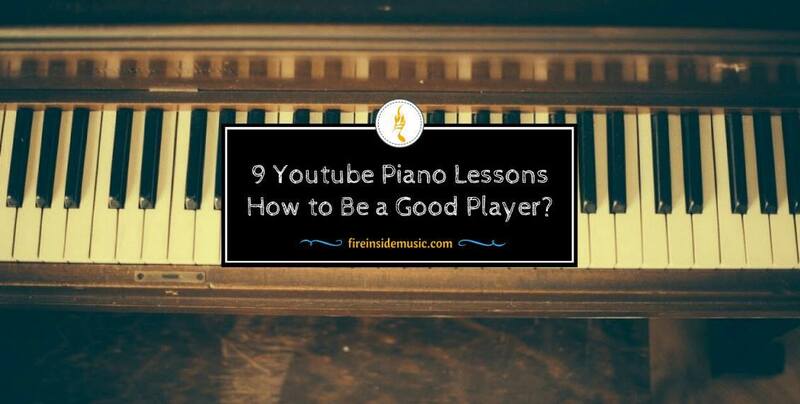 9 Youtube Piano Lessons: How to Be a Good Player? In the past, the library is the best resource to learn what we want. However, when it comes to piano, it's quite complicated to learn from only books. Now, Internet with online lessons provides you a better ease, especially youtube piano lessons. What you need to do is just take a look at videos and follow step-by-step instruction. Obviously, I don't assert that even the most informative and high-quality videos can replace an interactive with a piano teacher because they can't check your posture, or discover your mistakes. ​Not only piano, when you begin with anything, but it’s also better to have a starting point. Learning piano is similar and its starting point is Middle C.
Let you make a C Major Scale on the white keys to build chords which are called triads or three-note chords including C chord (made up of the C, E, and G notes, F chord (F, A, and C notes), the last chord ( G, B, and D). After the chords have been built, you add the root of every chord in your left hand. This process is called a chord progression. Keeping a proper posture is the first thing as well as the most important lesson you need to learn because it may influence the playing process. First of all, don't slouch - this action minimizes your mobility on the keyboard. Moreover, when it comes to aesthetics, slouching also creates an ugly look for thousands of audiences while you are on the stage. Therefore, make sure you always sit up straight when sitting in front of the piano even in practice. Elbows are also parts which influence your posture so be sure you keep a right distance which offers you full reach and mobility at all time. Putting them at a 90-degree angle is right. On the contrary, if you push your elbows behind the body, the bench will be too close to the piano. Or if you stretch your elbows further than what you should, the bench is also far back the piano. However, when the first musical notes start, your emotion also begins. In this case, you will see yourself are not in the original posture anymore such as leaning into the piano even hunkering down to jam out. You need to discriminate the differences between these perfectly acceptable artistic movements with the wrong posture. What's more, a proper posture creates a solid foundation to play the piano without limiting your feeling. While playing piano, keeping proper hand posture helps you not only play your piano in the right way but also minimize fatigue. At first glance, it may be hard to coordinate both your hands but practicing this tip a few times may be useful. No matter what is your dominant hand, you need to put it in front of another a little bit. Next, be sure your wrists and the piano are level as long as your fingers can strike down straight with your desired strength without flicking at the keys. In case you let your wrists in too low position, it will be challenging to hit the keys in the right way. Conversely, the wrists are put too high the control may be a little out of your reach even incidentally you can touch the black keys. Your instructor in the youtube piano lessons or in real life will let you know about numbering the fingers to hit the key with your first or fifth finger. In this case, you need to know fingers with their appropriate numbers. Specifically, the first finger - thumb is one, the index finger is two, the middle finger is three, the ring finger is four, and the little finger is five. What's the chord progression? It includes a series of chords placed in the same pattern. For example, a chord progression in the key of F includes F, B flat, C, B flat, and come back with F.
Generally, the piano scale is the foundation of chord progression, so if your song is in the key of F, you should understand that its chords are based on the F scale. In a scale, F is the root, B flat is the fourth note and C is the fifth one. Therefore, you can arrange according to the order as follows: F is the I, B flat is the IV, and C is the V chord. In the modern music, these 3 chords are popular because there are many current piano songs written with only 3 of them in a series of keys. Actually, when playing with the chords on the keys, you can place them in any order even pick out the individual notes in place of playing the whole thing at the same time. Moreover, it's okay to play around with the different inversions or the pattern where you play your individual notes. To understand this concept, you should practice how to build a set of chords from a new key, E, for example. E is the root of the E major scale. Let you play F sharp minor - the II chord which is based on the second note of the scale. After that, let you hit the V chord (B chord) then come back with the E chord for some measures, next, the VI chord. Let you hit a measure with a C sharp chord which is the sixth note of the E major scale. Finally, that's the IV chord (A chord), the V chord and comes back the root chord of E.
As you can see, although I recommend a lot of chords, all are based on the scale of a key. In fact, there are many formulaic and common chord progressions. Yet, you had better start playing around with chords to have the feeling of how the combination of these sounds is. From this point, you can make a custom chord progression by yourself. You have to pay attention that speed here needs to be attached with dexterity. I will provide you a few tips to practice in the following youtube piano lessons. Let you begin with C Major. You can select your right or left hand to start and hit the first 5 notes of the scale (remember to use all your five fingers). Play from C to G after that do it again. One note for this task is that don't play fast because you are just the beginner. A nice and slow starting will ensure all your notes are played at the same volume. If you want to move your fingers in a steady and straight down motion, don't flick. Now, it's time to move your fingers to a full scale. Firstly, beginning slowly and just playing up and down one octave. When you feel your steady and even motion on the notes, you can increase your speed finger. You should invest in a metronome for this practice section. Just start with a slow speed then increase little by little until you reach the speed set in the metronome. This way helps you have a right sense of the musical timing and play blues scales. In a blues song, it will be great if you play fast blues scale at a suitable part of that song. Last but not least, to increase the speed of your fingers on the keyboard, I can't but mention to arpeggio. What's arpeggio? That means you hit the individual notes of a chord in place of playing all of them together. How to do is to play your notes of the selected chord after that working on the keyboard in your own way, playing the octaves of the chord higher and higher. No matter what way you choose to practice, keep in mind that beginning slowly and increase little by little to make sure you don't take shape a bad habit while playing the piano. Thus, don't worry and play with what I said, your muscle memory will be improved to hit the scales faster without needing to think about what notes you have to play next. ​As you see in the youtube piano lessons I mentioned, playing the piano is a combination of many things and ears are one of them so you can't skip this. Here are some useful and basic tips and tricks to train your ears. What you need to reach this step is to shorten the distance of translating what is in your mind into what you play on the keyboard of the piano. This is different to tone deaf if you are able to hear the interval going up and down. You should learn a bit about how to listen and understand scales instead of paying attention to the interval and explaining how chords move together. Just consider the keyboard as a visual representation of what comes into your mind. It relates to 4/4 time (common time). There are 4 beats/ measure in 4/4 time. As the name suggests, one whole note takes up a whole measure. If you would like to know how to hit a whole note properly, use the metronome. Hit and hold a key with a click of that metronome for 4 times. A new measure will begin on the fifth click. That's the time to play the note again. Keep in mind that the click to start is considered a count so let you click, click, and click more. ​Like counting whole notes, the quarter note is the basis of 4/4 time (common time). Also, a quarter note represents a beat in 4/4 time so there are 4 beats/ measure. Use the metronome to have a good feeling for quarter notes. First of all, you play a key on a click of it and do that again on every click. After 4 times, you play a complete measure. Doing this in a couple of times until you feel everything's ok. Because this is the basic thing of 4/4 time, you will use quarter notes a lot while playing a song. The count might be cut in half (half notes) or doubled (8 notes) even being altered (whole notes or sixteenth notes). ​Like other notes mentioned, half notes are also common and relate to 4/4. Furthermore, there are also 4 quarter note beats/ measure. Because compared to a quarter note, a half note lasts for twice, you had better hit a note after two beats. In a measure of 4/4 time, there are 2 half notes. In sum, youtube piano lessons are the best way for you to learn new piano skills just by watching what people in the videos do and emulate. It makes your learning process of piano easier. Do you like my article? Is my list enough to meet your learning demand? If you have other helpful lessons to add my list, don’t hesitate to let me know by leaving a comment in the section below. Also, share with other people if you see this is an informative post.